Big supermarkets and online grocery retailers must display the unit price and the unit of measurement of a grocery item alongside its selling price (unless the item is exempt). Unit pricing is a labelling system that allows you to compare prices when buying groceries. By using standard units of measurement you can easily compare the prices of products, regardless of their size or brand. Unit pricing means you don‘t have to make complicated calculations to work out which product offers you the best value. Most supermarkets and large grocery stores are required to display unit pricing. Online retailers that sell a wide range of food items are also required to display unit pricing. You may not find unit pricing in smaller stores or stores that sell a limited range of grocery items. You should find unit prices on in-store shelf price labels and promotional signs, online listings, and in newspaper and catalogue advertisements. Not all grocery items must be unit priced. Unit prices can appear as per litre, kilogram, 100 millilitres, 100 grams, 10 grams or per item, depending on the type of product. Some grocery items use a different unit of measurement. These include fruits and vegetables (per kilogram or per item), meat, seafood and poultry (per kilogram or per item) and beverages (per litre). Grocery unit prices are worked out to the nearest 1 cent, rounding up for 0.5 cents or more and down for 0.4 cents or less. 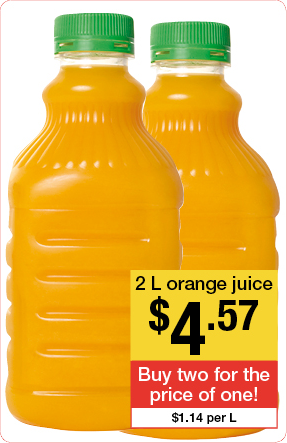 laundry detergent Y costs $5.74 for a 1.5 litre bottle. Its unit price is $3.83 per litre. The cheapest product is laundry detergent X. Compare the unit price of different sizes of the same brand’s product, as well as products from different brands of the same product. Look out for special offers which might temporarily have the lowest unit price – but not always. The unit price of large packs is often lower than small or medium size packs. But avoid buying a bigger pack if it’s likely to go to waste. If a product is available loose or pre-packaged, check the unit price of both. Compare unit prices in different parts of the supermarket. The same product may be sold in different sections, for example, cheese, meats, seafood, nuts, fruit and vegetables. meals prepared at the retail premises for immediate consumption. items sold from vending machines. Unit pricing must be displayed where two or more of the same grocery items are offered for a single price. Bundles of different types of grocery items do not require unit pricing. Unit pricing is not required where similar items of different sizes and weights are sold at a single price. We explain how unit pricing works in practice. If you find a unit price missing or confusing, we suggest contacting the business about it first. If that doesn't resolve the problem, please contact the ACCC.